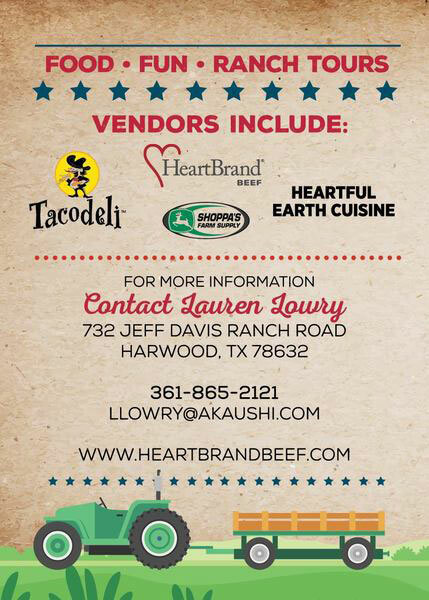 HeartBrand invites you to attend their “Story Behind the Steak” field day, held Saturday, April 14, at the ranch in Harwood, Texas. HeartBrand is one of the nation’s largest family-owned branded beef companies and is the largest producer of Japanese Akaushi cattle in the world. It is also recognized by the National Cattlemen’s Beef Association as a Top 25 U.S. Seedstock Producer. The event will include tasting HeartBrand beef, and vendor displays from Tacodeli, Shoppa’s Farm Supply, Heartful Earth Cuisine, and more. Attendees will also have a chance to register to win a HeartBrand-loaded RTIC Cooler. For more information, contact Lauren Lowry at 361-865-2121 or email llowry@akaushi.com. The event is free of charge and open to the public.